“The times they are a-changin’.” This pertains to most everything in our world today, but none more so than how seniors communicate. A digital-savvy senior now uses email, Facebook, and a cellphone when they used to use a landline and get all their news from the newspaper. Senior home care in Toronto today finds our elderly using all kinds of “newfangled” apps for information, entertainment, and organization. If your loved one wants to stay in touch, recommend some of these 7 helpful apps for the elderly. Maybe they already have them, and they can teach you about some new ones. This free app will keep anyone entertained, but your senior chooses the kind of music they want. They can pick a genre, time period or artist and create their own playlist. This is another free app on Android phones that is useful for everyone. Your senior doesn’t have to wait for the local weather on TV anymore. If they are planning to go somewhere in the afternoon, Dark Sky will pinpoint the forecast for their locality. It is so specific, it will send alerts that rain or snow will begin at an exact time. 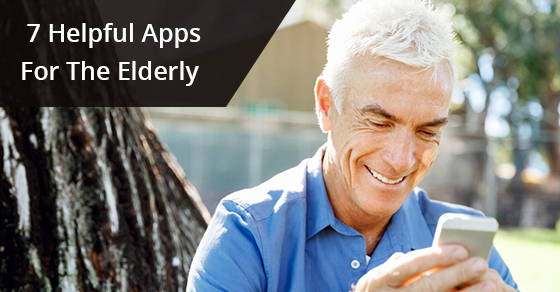 This well-being app is beneficial for both the senior and family members. You can track how they are doing, where they are, how they slept, their activity, any long-term trends. If you are involved in senior home care in Toronto, this app can give you peace of mind. Send it to other members of your family circle. Who doesn’t like this one? Now our seniors can communicate with any loved one no matter where they live. They can chat face to face with old friends who have moved away, and their grandchildren or children living in another state. You can probably find a pharmacy in your area with an app. With certain pharmacy chains, you can track prescription refills, get senior discounts, and seniors can scan barcodes from their prescription bottles into their smartphone. This is surely a helpful organizational tool for anyone. You don’t have to necessarily be a senior to misplace your keys or even your phone. This very convenient tool will help anyone find whatever they have temporarily misplaced. Your loved one will never again forget to take their medications on time. Be sure the volume is up if they have hearing issues. Take advantage of of these helpful apps. They will assist your loved one to remain independent as long as possible. When you need help with senior care in Toronto, C-Care Health Services can provide all the necessary professional home health care for your loved one. Request a quote. We are here to answer all your questions.